The College and Career Guidance Center provides information to students and families to enable them to make wise decisions essential to their spiritual, academic, social, and emotional growth. 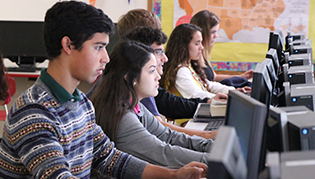 Our school's academic counselors advise students on how to choose a college to suit their interests, as well as assisting students to complete college and scholarship applications. Additionally, our counselors offer students guidance towards college majors that fit their interests and college preparatory coursework. Academic counselors also provides many services to parents including information on college fairs, college application nights, and financial aid nights. The high school level sponsors school visits by individual college representatives throughout the school year. 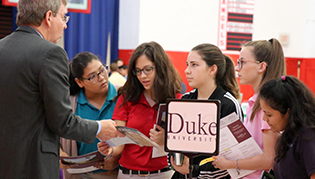 Visit our College Planning webpage for a list of upcoming college and university visits to Incarnate Word Academy. For more information about college planning services, please contact our Academic Counselors Mrs. Sherilyn Calhoun or Mrs. Hilda Cantu. There will be a Summer Discovery Camp for students completing grades 9-12. High School Aerospace Scholars is an interactive, online learning experience that culminates in an all-expenses-paid, week-long visit to NASA's Johnson Space Center in Houston during the summer. Information Session for Students and Parents about Duke, Georgetown, Harvard, Penn, and Stanford. Seniors who are interested in engineering, technology and design, or the automotive industry may apply for the Buick Achievers Scholarship Program. Application Deadline is February 29, 2016. Students should register in Naviance and communicate with their teachers ahead of time if they would like to attend. There will be a Texas A&M University presentation on Friday, January 15, 2015. Students who are registered to take the ACT on October 24, 2015 should check the ACT website that morning morning for possible changes due to weather. The application deadline for the scholars program is 11:59 p.m. EST on November 15, 2015. You might discover a new college that was not previously on your radar to add to your "colleges I'm thinking about" list in Naviance and continue to learn more. Major Andrew Yang, admissions officer, from the United States Military Academy at West Point will visit with interested students on Tuesday, August 25, 2015. The deadline to register is Friday, August 21, 2015. Late fee applies. Attention all seniors: There will be a Texas A&M University Application Kick-Off on August 5, 2015 at Brewster Street Icehouse.